Upon the tombstones in Chester New Jersey are the following inscriptions. Long Island, March 20, 1689 and removed from thence to Roxbury, May 17, 1737, where he continued to reside until he departed this life May 11, 1759 aged 70 years, 1 month and 11 days. HERE LIES the body of Penelope Horton, wife of Samuel Swayze, who was born in Southold Long Island, Feb. 14, 1690 and removed from thence to Roxbury, May 17, 1737 where she continued to reside until she departed this life Dec. 1, 1746, aged 55 years, 9 months and 17 days. The Momuments at these graves are of brownstone, about 200 feet mortherly from the church and about 75 feet from the road fence. 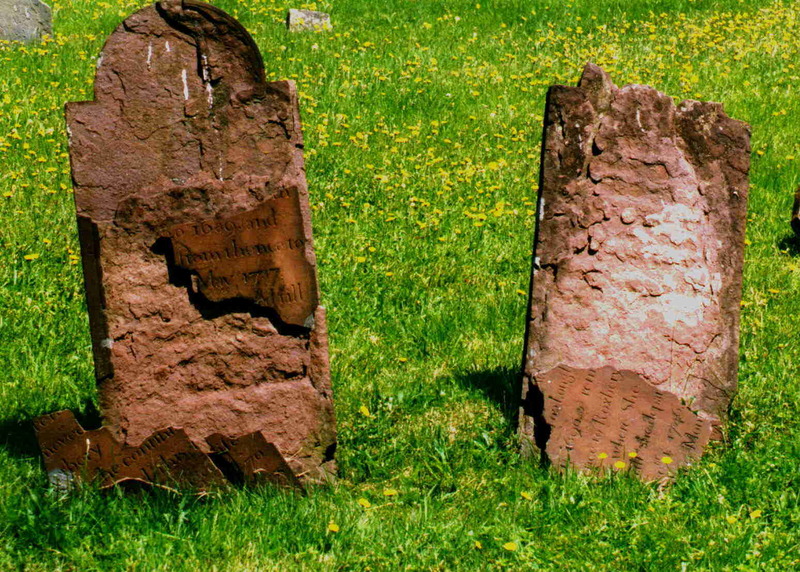 These tombstones are in need of Restoration. As you can see. Considering  THEY ARE TWO hundred years old. are  ALL OF OUR ROOTS FOUNDATION. THIS PHOTO IS 2 YEARS OLD. A FAMILY REUNION WILL BE COMING UP SOON. CHECK IT OUT. CHECK OUT ALL THE LINKS SWAYZE NEWSLETTER ON HOME PAGE HERE. TOMBSONE PHOTO PROVIDED BY JIM SWAYZE. E-Mail ME: This will e-mail me at home.